Spectacular Villa on the Beach!! Playa Madera Villa on the beach with huge pool! 4 Bedroom/5 bath. 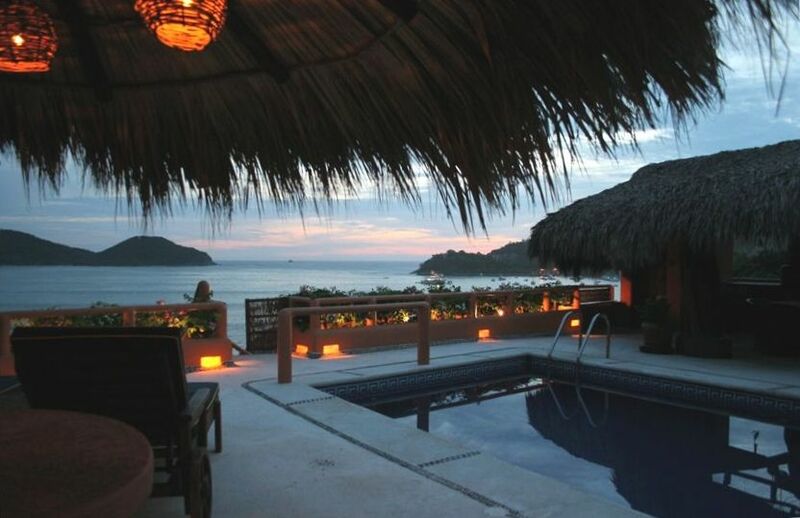 CASA QUIXOTE is one of the few luxury homes on Madera Beach and the only one of its kind that is offered for rental. All accommodations offer a private and unique feel. The Villa has an air conditioned king-size master suite, dressed with linens of the finest cotton. It features separate his and her bathrooms, that open to the beautiful 42-foot swimming pool and alfresco living salons. There is a well-appointed master kitchen, BBQ, and dining area, ideal for entertaining small and large groups. Each of the additional three king size suites offer a stunning view of the Bahia, a quiet sitting area, and its own kitchen including a refrigerator, stove and microwave. Off the master kitchen is a cozy study and library which can serve as an additional bedroom. All levels can be reached by the elevator. Also, the master suite is handicapped accessible. We are within walking distance to El Centro (downtown), the Fishermen's Walk on Playa Principal (main beach) and popular LaRopa Beach. There are world class restaurants, bars, art galleries, shopping, fishing, farmer's markets and all types of water activities available within a few short minutes. Every suite offers spectacular views of Zihua Bay. A short staircase to the sand. Available in the Master Suite, Panza Suite and Office, although it's not needed most of the year and there are many ceiling fans throughout the house and in all Suites. 42' Pool, BBQ, steps to the beach, massage table, kitchenettes in all the suites, full kitchen on main floor, office with a single bed. There are several alfresco living salons around the pool and under the palapas. The 3 suites other than the Master have their own kitchenettes and the main kitchen has all new stainless steel appliances. There is a dining table which easily goes from casual to formal. There is a BBQ and table under the palapa; a perfect spot for intimate dining under the stars. There is a dock for your ipod. There are several world class golf courses at nearby (15 minutes) Ixtapa. We’ve used VRBO for years and this was our favorite so far. We always go on group vacations. This is an open-Air house with lots of stairs so not suitable if you have problems walking. But easy 50 yard trek to beautiful Madera Beach. We had breakfast almost every day at Bistro Del Mar on the beach. The pool at this house is amazing and perfect temp - and the ocean water was perfect as well. From the beach you can access the paved walkway along the water and walk to the marina and town. No car needed here. The town was larger than we expected so lots to explore. And amazing restaurants!! If I have any complaints it’s that the beds were too hard and it was difficult to get hot water in some of the showers. But I would still give this place 5 stars. This is has been our favorite destination in Mexico and we will be back! Our stay at Casa Quixote couldn’t have been any easier. Between the information provided, suggestions and amenities, it allowed our group to just have a carefree getaway. The pictures don’t do the house justice. The rooms are all large and welll appointed. House feels secure and has fantastic panoramic views throughout. The styling and layout of the communal areas lend themselves to a family/friend vacation that will not be forgotten. This house maintains its value and then some. Don’t pass it up. Also, don’t forget to get a the best massage on the beach every day for $11USD! Three enthusiastic thumbs up for this home away from home! We are so happy you loved your stay at Casa Quixote! Property is beautiful, and within walking distance of the beach! We enjoyed our stay. The pool was gorgeous and has a stunning view of the bay. Would highly recommend staying here! I've stayed at Casa Quixote multiple times in the past several years. This is my favorite destination in Mexico. This house offers a private pool exceptional views and easy access to the ocean. Step out the front door and you are on the beach. Take a stroll down a beautiful ocean side path to the middle of town for some great shopping and restaurants. The only decision you have to make is to swim in the pool or the ocean. The house is great for large groups as well as small, we have done both here. We took our whole family down last year for Thanks Giving including our adult kids and grand kids. Everyone had a blast it couldn't have been more perfect! We even cooked a few meals at the house. The staff met us upon arrival and helped us out getting acquainted with the house but didn't interfere at all. I'm looking forward to our next visit!! Casa Quixote was a fantastic place for 3 couples and 3 kids. We really enjoyed the view, location and accommodations. Playa Madera was wonderful for our children. The proximity to town was great for sampling restaurants, shopping and exploring the market. The pool was perfect when we didn't feel like being on the beach. The owners were very helpful in making recommendations for restaurants and activities and arranged for a cook who did a fabulous job of preparing our favorite Mexican dishes. Of particular note was the amazing fresh seafood we enjoyed for almost every evening. Reyna (the housekeeper) made sure we were well taken care of in every respect and kept the house clean and tidy as we turned into our lazy vacation selves. We enjoyed a fun day trip to Playa Los Gatos, complete with scuba diving and a fresh-caught seafood platter served up right on the beach. Also of note was the fabulous massages many of us enjoyed from Antionia...who comes to the house! One thing to note is that it was good for 5 year-old water safe children, but might be challenging for younger mobile children (toddlers), as there are many levels and railings and the pool is in the middle of the common space.